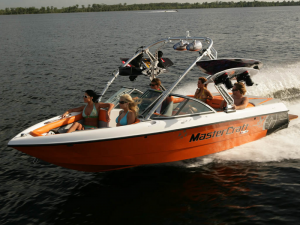 Upper Lake Mary boat rentals and guided boat charter services. Try our newer model jet ski rentals, sea doo rentals, waverunner rentals, and PWC personal watercraft rentals. Upper Lake Mary is about 12 miles southeast of Flagstaff, Arizona in a heavy forested area in the Morman Lake District of the Coconino National Forest. Lake Mary is a beautiful sky blue lake surrounded by Ponderosa Pines and meadows with views of the San Francisco. The “Upper Lake” is not to be confused with its twin sister, “Lower Lake Mary” which is usually close to being empty. Upper Lake Mary is much larger but is a bit farther. Upper Lake Mary is a long and narrow lake that is popular with power speed boat rentals, waverunner rentals, wakeboard lessons, wake surf lessons, and water ski lessons. Upper Lake Mary, the further upstream of the two lakes, is formed by a small earthen dam on Walnut Creek. Upper Lake Mary has a maximum length of about 5 miles, and a maximum width of about 2,000 feet. During dry seasons the lake will narrow and shorten which allows less choppy water for all your water sports. Upper Lake Mary serves primarily as a recreation facility and offers a number of outdoor activities. Boat ramps provide access for power speed boats, and the lake is a popular destination for water skiing instruction as the lake does not have a limit on engine size.